“We didn’t really have that much to do (in ‘Thor: Ragnarok’) I felt like the warriors three in that franchise weren’t exactly used to the fullest of their capabilities,” Levi said in a press conference held in Seoul on Tuesday, about playing the role of Fandral in Marvel Cinematic Universe’s “Thor” franchise. Instead of playing second fiddle to another superhero -- or more realistically fourth or fifth in the case of the “Thor” movies -- Levi is the main guy in “Shazam!” set for release in April. He plays the titular character: 14-year-old Billy Batson, who transforms into an adult superhero wielding incredible magical powers upon saying the word “Shazam!” Asher Angel plays the child version of Billy. The notion of a child in a full-grown man’s body, director David F. Sandberg says, is what sets this film apart from countless other superhero films that came out before. On playing a bulky superhero who is really a child inside, Levi said that he had so much fun because he has always been a man-child. This may have helped him land the job. He is the second director from The Conjuring Universe to participate in the film franchise widely known as the DC Extended Universe, with James Wan having released “Aquaman” last year. Wan, mixing impressive visuals, elements of horror and suspense with a lighthearted superhero format, managed to give struggling DCEU its biggest commercial success yet, grossing $1.15 billion. It appears that Sandberg has also injected elements of different genres to his new film, which, from the trailers, looks to be a comic superhero film. “To me ‘Shazam!’ was the perfect movie to make. It reminds me so much of all the movies I loved growing up with, and made me fall in love with movies. Like ‘The Goonies,’ ‘Ghostbusters,’ all these film that have not just humor and drama, but they even have horror as well. 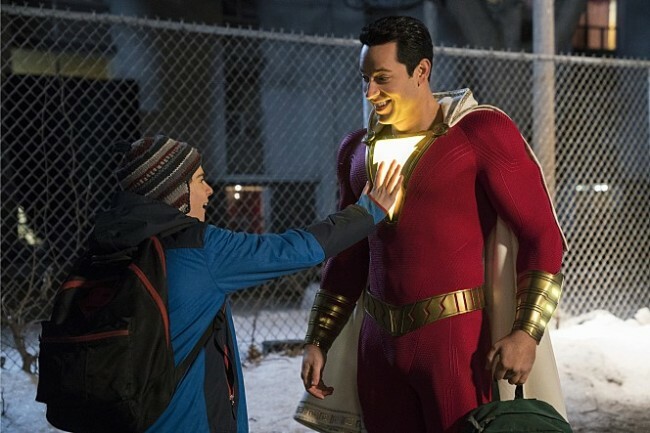 So I tried to incorporate all that in ‘Shazam!’” he said, adding while the film will have some horror elements, it would not be to the extent of his previous work. Based on the character from the DC Comics, the film tells the story of a troubled orphan Billy who is chosen by an ancient wizard to receive godlike powers. Billy and his foster brother Freddy Freeman (Jack Dylan Grazer) must find how to use his new powers and prevent the villainous Dr. Thaddeus Sivana (Mark Strong).